This is a pretty good case of U.K. being better at horizontal BnZ than the others. But yes only take one ordinance type, a full load slows you down too much to maintain your advantages, preferably bombs for less penalty and more damage. So I got myself the Hornet again. Deciding between going back to the 262 or the Hornet, I was recommended the 262 as being the easier line but, having sold my Attacker, I ended up with a 7 point British pilot without a mount, so I decided to give the Hornet another bash. My previous experiences have been posted above but having thought and discussed it, I decided to give the "no wing rockets" plan a go. So... yeah. The plane feels a lot better now. I swear that the wing rockets impact rate of roll as well as speed as the Hornet without them feels a lot lighter and easier to fly - more like the Mosquito before it than the brick it was that I recalled. In a way, that's kinda like the 190 A-5 and its external ordnance - which is why I run the A-5 "clean" in the first place. So, on second glance, the Hornet is a much more capable plane than I'd thought. Looks like I'll continue progress down the UK heavy tree after all. we talked just today about your Hornet! i'm enjoying the Mossie, though! I've been stuck in the Hornet for a while now... I just don't have the heart to grind through it. But I don't want to rage sell it, just hoping it will get better, but it is a dog of a plane. Best thing I have been able to do with it is dump its impressive load of ground munitions on a big target and zoom away looking for unwary targets and hoping players in better planes (i.e. any other plane) can't catch up to me. The Mossie was disappointing, but this Hornet is a dog turd with wings. EDIT: Ok, with this in mind I decided to take it out for a spin again for about 3 battles. Won 2, scored 11-14k in them, and the one loss was my own dumb fault. It is still sluggish and no where near fast enough for its job, but I was able to work the guns at longer range (with Long gun barrels) and made it work. Maybe, just maybe, I'll take it out for the x2 whenever I play and slowly mooch my way up. Edited by ElricJC, 17 October 2018 - 11:21 AM. So a while back I actually did buy the Hornet, been fairly slowly chipping away at it & actually finding it not nearly as horrid as I'd expected. Actually even fairly much enjoying it now I've got the top engines. Today got a 15k battle even. Have been doing as others suggest, mounted just the bombs, drop them for some points, stay quick & pick off distracted enemies, also the odd bit of bomber/bomber flight destroying. I think I'm helped by having perhaps clicked on how to play some of the multiroles like US XP-44 where I'm having to be much more careful about maintaining my speed & keeping a Boost reserve. I dunno, pretty hard to go past the glory of I-220, I don't think Hornet is even coming close to it. I did say "all-round" I-220 is the best fighter bar none, but it has weaknesses - it cannot solo cap Missile Bases and has trouble soloing Command Centers. Its also less capable of dealing with B-32s, especially if the B-32 has friends nearby since you're forced to engage the escorts while the Hornet can just blaze in, smack the B-32 around and just keep going and, as an added bonus, your bombs can mess up a B-32's beautifully planned drop by sniping a target in his bomb path. More HP, more firepower, higher speed, longer more powerful boost and two 1000lb bombs - the I-220 is king of the fighters, but if you need to do everything on the map, pick the Hornet. Edited by SpiritFoxMY, 29 January 2019 - 01:51 PM. but if you need to do everything on the map, pick the Hornet. Is it really that good ?? Well, I now basically consider the Hornet the high point of the line to date. The Mosquito I thought was alright but not spectacular but in light of my experiences with the Hornet, I might have to go back and try it without its rockets - like the Mosquito its actually the fastest heavy fighter in a flat out boost when fitted only with bombs. The Lightning can catch you but only if he sacrifices all of his external ordnance. Edited by SpiritFoxMY, 29 January 2019 - 05:38 PM. 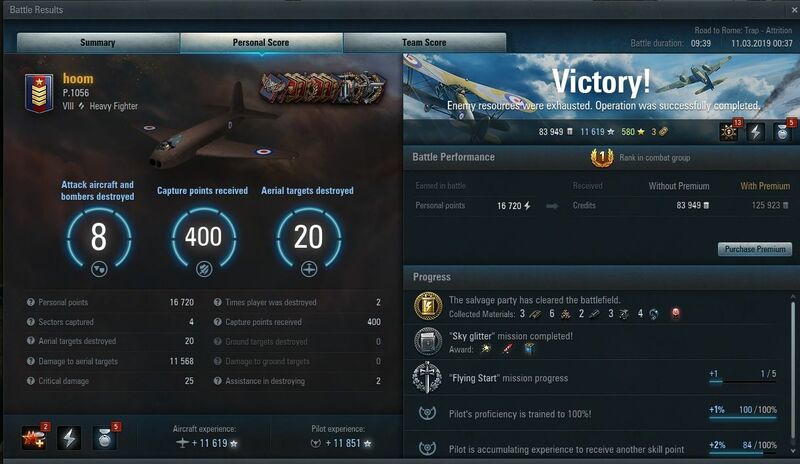 Gotta say the Hornet has actually been quite magnificent, I've had a whole heap of 15k+ battles in it & even closed it out with a 17,260 point battle. Its gonna stay in my Hangar but currently un-piloted since I don't have any spare UK pilots, may repurpose one though. Whats the plan for the P.1056? Is it worth keeping bombs on? Feels like a plane that likes keeping altitude & as much base performance as it can so I'm inclined to not run bombs. Priority upgrade the 40mm or engines? Engines. She's a dog without them. Well I've been flying the p.1056 in Assault a bunch today. I really thought I was gonna have a hard time with the brickgility but that seems to be a relatively minor consideration, the firepower is just amazing even with 'just' the 6* 20mm loadout. Have the first engine & took the bombs off to maximise the anti-air ability, just unlocked the 40mm as I'm writing this, what a beast. Usually with a pint of ALE to wash down the bangers and mash. Followed by more pints of ALE. Perhaps a few stout LAGERS. That is how one flies British Heavies. WAY TO HOOM....FLIPPIN EXCELLENT JOB with that heavy. Edited by losttwo, 23 March 2019 - 01:44 AM. Except the problem is that if you are diving to get down there, you are giving your tail to German heavies that have a huge alpha. I have never feared Brit heavies, ever. I have been beaten by Hornets, but never more than once.